Sri Lanka's fast bowling coach Champaka Ramanayake is confident that his young and inexperienced charges can spring a surprise on England in the upcoming three-Test series. Ramanayake, who played 18 Tests and 62 one-day internationals from 1988 to 1995, will have to make the most of limited resources especially in the pace department. Without the retired Chaminda Vaas and Lasith Malinga the onus will be on Dilhara Fernando, who has played 35 Tests, to lead the attack. Fernando missed Sri Lanka's first warm-up match against Middlesex, at Uxbridge, but will play against England Lions next week ahead of the opening Test in Cardiff. The total experience of Sri Lanka's five seam options is limited to 105 wickets in 43 Tests with 90 of those coming from Fernando. None of the fast bowlers picked for Sri Lanka's last tour to England in 2006 are around in the present squad namely, Vaas, Malinga, Nuwan Kulasekara, Nuwan Zoysa and Farveez Maharoof, although the latter was drafted in for the first week of the tour. Fernando toured England in 2002 and is the only bowler with some kind of experience in English conditions. "Yes, we have one of the most inexperienced fast bowling line ups taken to England. Except for Dilhara Fernando the others haven't played much Test cricket at all," Ramanayake said. "It's an opportunity for the youngsters to take over and continue. We have the disadvantage of inexperience but looking at it the other way none of the English players have played against our fast bowlers before. It's an unknown attack to them. I think with that we can unsettle them." England will know plenty about Fernando and did have a brief taste of Chandaka Welegedara, the left-arm quick, when he made his Test debut at Galle in 2007 but their preparation for the rest will rely in video footage and some advice from Andrew Strauss who hit 151 against them at Uxbridge. 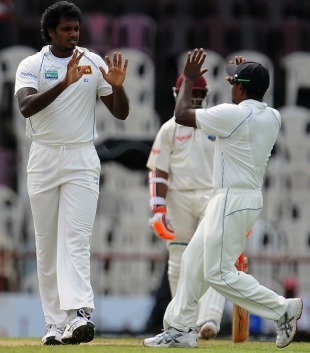 "The Englishmen don't know much about these bowlers and they have not faced them," Ramanayake said. "It will take some time for them to gauge them and get to know what they are doing. They all bowl quite sharp. Nuwan Pradeep and Thisara Perera bowl in the 140s, Suranga Lakmal has already played two Tests against West Indies and bowled really well. "Perera is waiting on the wings to get into the Test team and has done well in the past year and a half in ODIs. We've got some good youngsters and I am quite happy to take this squad because we can really work something with these boys. They can improve and you'll never know they'll get wickets in English conditions. I have great belief in them that they can do well." Pradeep, who had an IPL contract but left early along with captain Tillakaratne Dilshan, is one who comes in for particularly praise from Ramanayake. "You take Pradeep he hasn't played any cricket at all in his younger days and at school," he said. "He's got raw pace, beautiful rhythm and consistency. Consistency comes from rhythm. If the rhythm pattern changes then you don't bowl a consistently good line and length. You've got to be smart as well nowadays. "You got to expect what the batsman is going to do, assess conditions and adjust to the situations and bowl. All these young fast bowlers they haven't got it yet, but they are getting it from the exposure we give them. They got the right ingredients and this is the best bowling unit we have right now." Ramanayake also hopes that responsibility will help bring the best out of Fernando who has always been foil for the likes of Vaas and Muttiah Muralitharan but now has to be a spearhead on his own. "Dilhara hasn't played much cricket in the last few months but still the selectors have faith in him," he said. "He has to deliver the goods because he is the only experienced bowler and he has to show that he is good enough to play Test cricket. That will give him a little bit of responsibility to take up the challenge and do well in England." Ramanayake thinks Sri Lanka will play three quick bowlers in the Test series, although there best chance could come if the dry weather continues and their spinners - Rangana Herath, Ajantha Mendis and Suraj Randiv - can play both an attacking and defensive role. "The two warm-up games are vital for us and whoever performs well will have a good chance of playing because you got to get used to the conditions," he said. "Depending on the pitches three will definitely play or maybe four if there is a lot of grass on the wicket. We are expecting some seaming tracks, but you never know. "England has been quite warm. The weather pattern has changed and we might get warm weather but normally in early summer the wickets are expected to seam. We've also got three good spinners in our attack. Rangana very experienced, Suraj has been bowling really well and Ajantha has also got some experience."